What happens when local small businesses bring a healthy dose of creative talent and out-of-the-box thinking to their entrepreneurial mix? What happens when they see themselves as progressive artisans and thought leaders and feel empowered to spread their enthusiasm with fellow local business owners? Business zones in cities and towns that were once depressed and/or even blighted are resurrected and revived. Economic prosperity blooms and grows in fresh and remarkable ways. There’s a name for these small business mavericks and innovators – they’re called “gazelles.” They take a fresh look at a place and its elements; they rearrange things, turn things over, add new twists. They notice new possibilities for creating appealing places. They let go of labels, status quo and tradition and instead put out the welcome mat for fellow citizens to rediscover areas and neighborhoods of their city anew. We’re very fortunate to have several of these “gazelles” here in Long Beach: small business entrepreneurs who have the vision, focus and leadership savvy to grow their business in leaps and bounds. Two inspiring local examples are Kerstin Kansteiner, owner of Portfolio Coffee House, Berlin Bistro and head of the 4th Street Business Improvement District, and Luis and Brenda Navarro owners of Lola’s Mexican Cuisine on 4th Street. The three embraced a Placemaking tactic called “parklets” that have brought extraordinary results to both their businesses and very positive media attention to Long Beach as a progressive city ready to try out new ideas. The idea for these parklets came from successful experiments in San Francisco. Kerstin, Luis and Brenda did meticulous research (including a trip to San Francisco to see parklets in action) and it sold them on moving forward with the concept. Their credibility from working successfully with the City on other recent community projects made them a welcome partner at City Hall. 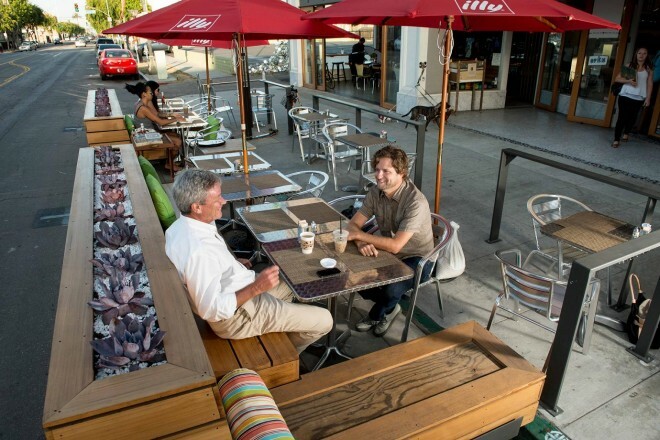 In January 2012, the first parklet in Southern California was installed at Lola's. It measures seven and a half feet wide and thirty feet long - equal to one and a half car parking spaces. But what is a parklet? In this case it’s 225 square feet of highly visible, beautifully designed outdoor dining space for twenty plus people. This is prime real estate owned by the City of Long Beach that was previously being used to park two cars for free. The second parklet at Berlin Bistro opened just this past April. Both the Lola's and Berlin parklets are organized on a private business model. The business deal Lola's has with the City allows the restaurant to use the space as an extension of its sidewalk space. Lola's pays $850/year for a “Sidewalk Restaurant Service Permit” from the City. Lola's paid all costs of design, construction, maintenance and operations of the parklet to the City's standards. Luis estimates $25,000 has been invested in creation of their parklet. Lola's retains ownership of the parklet and can remove it anytime or for any reason. The benefits to Lola's have been swift, bountiful and ongoing. Immediately upon installation people took notice. The twenty plus prized sidewalk dining spaces became a highly visible calling card for Lola's. Elegantly crafted, designed, and built by local progressive architectural firm Studio 111 and JR Van Dijs Builders & Developers the parklet has garnered serious media attention, including a profile in Sunset Magazine on this innovative new way of using public space. Lola's sales numbers have already started moving up significantly compared to last year and Luis reports he has hired four new employees to keep up with the new demand. That is the power of place: the power to allure, to engage, to entice people to feel welcome, to spend time, to enjoy themselves. The success of the Berlin Bistro parklet has been even more impressive. At less than three months old the increased business brought in by the parklet has meant Kansteiner has needed to hire six new employees. Yes, I said six. Film and television locations scouts discovered both parklets almost immediately. Berlin’s parklet has already shot one car commercial and has another one scheduled. Luis and Brenda have hired a location agent to help them manage growing interest in Lola’s for TV & film. A third parklet is planned at Number Nine, another restaurant in Retro Row located about ten doors down from Lola's. The benefits of parklets to the City of Long Beach include new revenue from permits and increased sales tax. Both parklets are part of vibrant Long Beach business districts (Lola’s on 4th Street Retro Row, Berlin Bistro in the East Village) that have worked long and hard to create an interesting mix of businesses to create unique dining and shopping experiences. An additional benefit for all customers and residents was found while doing the overall parking inventory for both sites. Space was found for four new car parking spaces. Both districts are two of the first “Bike Friendly Business Districts” in the country as well, and have worked diligently to educate local citizens on the ease and benefit to themselves and the community of bicycling to support local shops. Charlie Gandy is the President of Livable Communities Inc., and is serving as the Local Host Chair for Pro Walk/Pro Bike: Pro Place, which will take place in Long Beach this September 10-13. Charlie is the founding director of the Texas Bicycle Coalition (now Bike Texas), and the former Director of Advocacy Programs for the Bicycle Federation of America (now the National Center for Bicycling and Walking).